In a highly controversial proposal, the Church of England’s General Synod is set to debate the abolition of the doctrine of the Holy Trinity as the first step towards being ‘intentionally inclusive’ of Muslims and moving towards healing and reconciling the centuries old divide between Islam and Christianity. The Church of England’s highest legislative body is due to meet at the University of York from July 7 to 10, 2018. Papers circulated to members of General Synod ahead of its sessions in York have been published online in two batches. The PMM has been proposed by the Rt Rev’d Josie-Josiah Jimplecute, Bishop of Breadford, a diocese that has seen the highest number of Muslim immigrants to the UK. Bishop Josie-Josiah, the CofE’s first openly transgender bishop, has been pioneering Alpha for Allah, a course for Christians wanting to become Muslims. ‘Alpha for Allah shows how the Qur’an supersedes the Bible, since the Qur’an was written centuries later,’ explains Bishop Josie-Josiah, who has campaigned against the disturbance to Muslim sensibilities caused by church bell ringing. ‘Moreover, while higher criticism has destroyed the authority of the Bible by proving it was written by human authors, we can trust the authority of the Qur’an because we know it was dictated by the angel Gabriel to Muhammad,’ she added. She also notes the complete absence of German higher criticism, which has so undermined the authority of the gospels, but has left the integrity of Qur’anic inspiration untouched. Commending the motion, Archbishop of Canterbury, Justin Welby, agreed he was strongly in favour. ‘Islam finds the idea of a Trinity utterly blasphemous to the idea of one God,’ he said in a BBC Radio 4 Thought for the Day. ‘It wasn’t dry academic theology and hair-splitting biblical exegesis, but all those delicious Iftar meals at Lambeth Palace and Southwark Cathedral that brought me closer to my Muslim siblings and resulted in a rea change of heart. I’m a bit like Esau,’ he said. “Lo! Whoso ascribeth partners unto Allah, for him Allah hath forbidden Paradise. His abode is the Fire…. They surely disbelieve who say: Lo! Allah is the third of three; when there is no God save the One God. If they desist not from so saying a painful doom will fall on those of them who disbelieve.” I don’t want to go to hell. It’s as simple as that,’ Welby magisterially concluded on Radio 4. Anglicans for Chrislam, a branch of Inclusive Church, have issued a statement arguing that ‘Christians look like fools when they claim that 1 + 1 + 1 = 1. Anglicanism is based on the three-legged stool of scripture, tradition and reason. So far, our maths has proved to be totally unreasonable. There are limits to which faith can push reason. We know now that gender is fluid and hence it is scientifically reasonable to claim that a human with male genitalia can identify as a woman or vice versa. This is why we are creating a liturgy for transgender initiation. But numbers are not fluid. It was Arab Muslims who played an vital role in the transmission of mathematics to Europe from the 10th to 12th centuries and it is possible they are playing the most vital role today in getting us to correct our flawed understanding of God’. Conservative evangelicals have begun lobbying in Synod to persuade members to vote against the motion. The Rev’d Janus Pliable, Rector of St Simplicio’s Church, Bishopsbottom, London, has said that his church will consider leaving the Church of England unless his bishop the Rt Rev’d Pandora Doolally declares where she stands on the issue. ‘For a very long time we have been talking about leaving the Church of England,’ he told reporters. ‘It’s a bit like Brexit. We are following the politics of good sense laid down by Prime Minister Theresa May. Every time there is an issue of orthodoxy, we threaten to leave but we remain. We are remainers, not leavers. Debates about the Trinity were common in the early church. We mustn’t despair, because the Church of England at least hasn’t yet given up on Allah. When that happens it will be a red line and we will leave. Until then, we will hang in there and hold on to our stipends, four-bedroom vicarages and church buildings even if we turn some of our church spires into minarets. The Church of England is still the best boat to fish from even if it is the Titanic,’ Rev’d Pliable said. 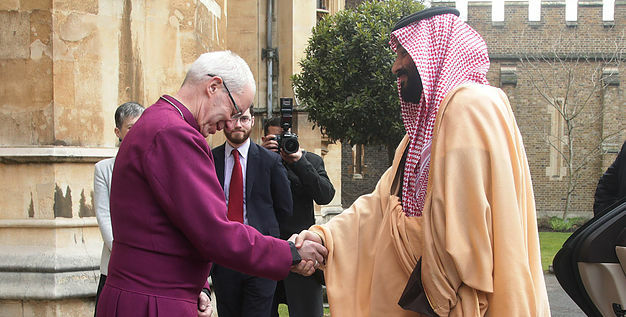 The motion has so far attracted 133 signatures and is expected to pass since the Muslim Council of Britain, Al Azhar University and King Salman of Saudi Arabia have been holding ‘mutual flourishing’ sessions with members of General Synod.